NCAA scholarship rules: It’s morally indefensible that athletic scholarships can be yanked after one year, for any reason. Athletic scholarships are no guarantee of a four-year education. They can be yanked after one year, for any reason. Last week, ESPN agreed to pay the Atlantic Coast Conference $3.6 billion to televise its athletic events through 2026-27. The ACC will earn those billions thanks to the free labor of Duke basketball players and Miami football players. Is there any rational argument that these unpaid performers shouldn’t get a chunk of that TV cash? Back in September, Sports Illustrated’s Seth Davis tried to mount such an argument. In response to Taylor Branch’s Atlantic polemic “The Shame of College Sports,” Davis wrote that it’s “indisputably untrue” that college athletes aren’t paid. “Student-athletes earn free tuition, which over the course of four years can exceed $200,000,” he wrote. If you buy that star athletes are compensated with a valuable education, consider this complicating fact: An athletic scholarship is not a four-year educational guarantee. What few college sports fans—and not enough college recruits—realize is that a university can yank that scholarship after one, two, or three years without cause. Coach doesn’t like you? He’s free to cut you loose. Sitting the bench? You could lose your free ride to a new recruit. Some schools have recognized that one-year scholarships, renewable at the school’s pleasure, are morally indefensible. The majority of Big Ten schools, as well as Auburn and Florida, announced earlier this year that they’ve started giving incoming athletes four-year guarantees. But if you think the nation’s sports powers are disposed to do the right thing, you don’t know college sports. Earlier this year, the NCAA held a vote on whether to end its ban on multiyear scholarships, which had been in place since 1973. Of the 330 schools that cast a ballot, 205 voted against four-year scholarships, including football titans Texas, LSU, and Alabama. Despite that majority vote, the tyranny of the one-year scholarship is no more—though 62.1 percent of schools voted for the one-year status quo, a supermajority of 62.5 percent was needed to maintain the ban on four-year scholarships. The schools don’t want it, but four-year athletic grants-in-aid are now permissible. According to a report in the Cleveland Plain Dealer, some schools opposed multiyear scholarships because they could “[reduce] the flexibility of a new coach to get rid of players who didn’t fit his style.” Remember that line the next time an athletic director bloviates on the glories of amateurism and the student-athlete: Your athletic ability is a ticket to a free education, so long as the new guy in charge doesn’t want to run the spread offense. A Division I athlete, meanwhile, has no control of his own destiny. If he wants to transfer to another D-I school, he must sit out at least one year—and if his current school blocks his release, he has to sit out two years. College athletes are unpaid workers whose movements are strictly controlled by their employers. That’s not amateur sports. That’s something close to indentured athletic servitude. 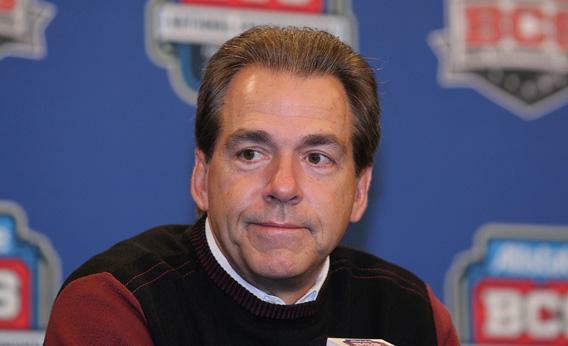 In the days before Alabama voted against guaranteeing college athletes a four-year education, the school’s football coach Nick Saban said he resented the implications of the new NCAA measure. “I think this is some people’s cynical approach to think that coaches don’t have the best interest of the young people that they coach in mind,” Saban said. My response to Mr. Saban: If you’re not cynical about major college football, then you’re either willfully stupid or the host of an ESPN studio show. In 1941, the Gainesville Times reports, an Alabama grad decried the school’s tactic of stockpiling potential football talent, then “[running] hundreds of players off either by flunking them out or forcing them to quit.” Replace “hundreds” with “dozens” and you’ve got the current Alabama football program. Division I football teams are allowed to have 85 players on scholarship. When a surfeit of new talent comes in, old players must get the boot to ensure the school doesn’t go over the limit. As documented on oversigning.com, more than 20 players left the Alabama program by choice or by force in 2010 and 2011. One of the school’s go-to techniques is the “medical scholarship.” Between 2007 and 2010, Alabama offloaded at least 12 athletes for medical reasons, including at least two who later told the Wall Street Journal that they were healthy enough to play. (On the bright side: Though a player on medical scholarship gets kicked off the team, he does continue to receive financial aid to finish school.) Another roster management strategy, seen often at Alabama, LSU, and other SEC schools, is to rescind a promised scholarship just before the student-athlete’s freshman year. And sometimes, as in the case of LSU’s Chris Garrett and Miami’s Steven Wesley, a veteran player loses his scholarship simply because the coaching staff changes its mind and doesn’t think he’s good enough. Saban claims he’s “never gotten rid of a player because of his physical ability.” I don’t believe him, but maybe that’s just because I’m a cynical person. I’m also cynical about Saban’s vow, in the immediate aftermath of Alabama’s failed attempt to quash four-year scholarships, that the school will start giving them out in 2013. After all, the skeptic will note, a school like Alabama will be at a recruiting disadvantage if it offers a worse deal than its rivals. And the school can always find a way to get guys to leave. An all-powerful coach can simply kick a player off the squad for “violating a team rule.” Or he can tell a wide receiver that he can stay if he wants, but he’ll never get off the bench. Voilà—the benchwarmer will leave of his own free will. The best high-school basketball and football players could also follow DeMarcus Cousins’ lead. In 2008, the prized recruit (and now NBA star) demanded that the University of Alabama-Birmingham assure him, in writing, that he’d be allowed to transfer without penalty if the coach he wanted to play for, Mike Davis, left the school. (Coaches, unlike their unpaid charges, are allowed to switch schools without penalty.) UAB refused, so Cousins went to Kentucky instead. Nothing about Dooley’s statement is true, though it is unintentionally revelatory. Four-year scholarships won’t prevent a coach from kicking a miscreant off the team. And the scholarship papers that student-athletes sign are the definition of a one-way street—an invitation for the coach to treat his players like pieces on a game board. I appreciate, though, the analogy to a student who “doesn’t perform at a certain GPA level.” Though it’s socially unacceptable to say so out loud, what coaches really want is the ability to take away athletic scholarships when players don’t perform at a certain athletic level. After all, that’s what they’re supposed to do.